Rick Janecek produces a collectively eclectic cast of handsome home furnishings. His dexterity for composition—and an innate elegant, eclectic aesthetic—has paid off since his first job at age 14 at the most prestigious department store in his Omaha hometown. “Luckily, people trusted a 14-year-old to merchandise their store,” he laughs. The self-ascribed “OCD designer” later became the store’s home fashion director and has since drafted products for Waterford and Lenox and spent more than a decade in creative director roles at Neiman Marcus and Global Views, where he oversaw all product design. But it was after a stint at Ambella Home that Janecek realized a market void—a gap between average affordable furnishings and high-end luxury pieces. “I wanted to create a line that could be somewhat attainable, a bridge between the typical import company and superdeluxe, American-made products,” he says. After conferring with friend and now business partner, Sheila Butler, the furniture and accessories company Handley Drive was born in January. Janecek’s design sketches for the Mansard tall cabinet (also pictured above). 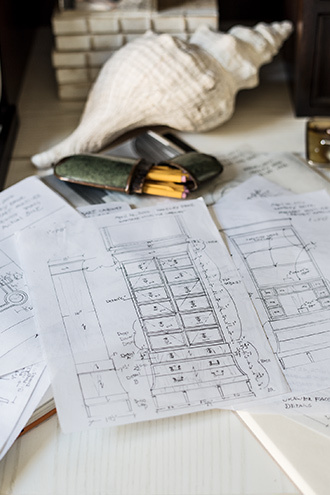 These days, Janecek spends hours at his desk, sketching designs by hand with Bic mechanical pencils, first drafting “wiry” scribbles on paper scraps before transitioning to larger sheets for proper proportion and tracing paper for details such as corners, edges, and feet. “A cabinet drawing might have eight pages,” he says. These illustrations are transferred to specialty factories he has carefully sourced in Asia, Europe, and the U.S., where they are brought to life by as many as four artisans per piece. The resulting collections are a mirror reflection of his own style—a blend of eras and genres. He isn’t afraid to mix a Japanese fishnet-imprinted ceramic bowl with an ornate, classic cabinet made of Italian ash and American walnut. 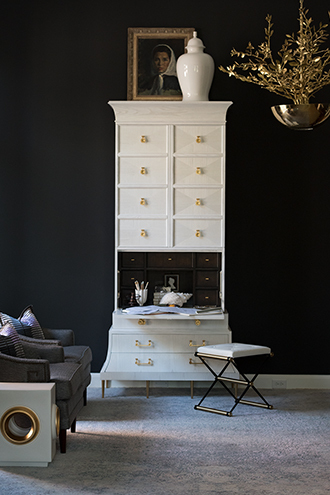 Or, a smoky eucalyptus cabinet with brass hexagonal insets and a 1930s graphic-art pendant inspired by twigs. His modern approach to blending vintage with transitional trends back to that cinema obsession. “My biggest design influence would be MGM Studios,” he says. “I love the set designs from the late ’40s through ’60s, a skillful mix of various styles.” Spoken like a true director.